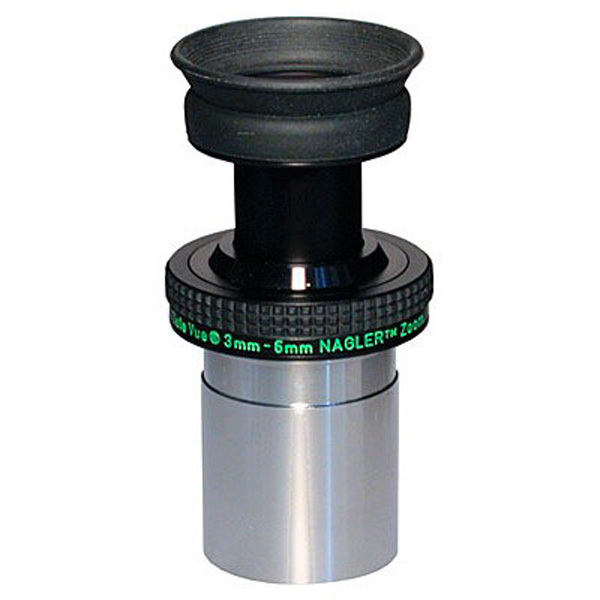 The 3-6mm Nagler Zoom is an exceptional, specialized high-power eyepiece for dialing in the optimum power for planetary viewing with short-focal-length telescopes, such as fast apo refractors. Imaging is superb, and the apparent field stays constant throughout the zoom range. Click stops define the 6mm, 5mm, 4mm and 3mm positions. It also lets observers choose in-between focal lengths, thus giving them the ability to tune the magnification to atmospheric conditions, which is very critical for high-power viewing. Concept / Background: I did not set out to design a zoom eyepiece, per se. David and I were discussing characteristics we'd like in a superior "planetary" eyepiece, and the zoom feature answered one of the major goals; how to obtain the highest possible useful magnification on a given night considering the ever-changing atmosphere. There were other aspects of equal importance and only the combination of all would satisfy our ethos in creating a "planetary" eyepiece: full field sharpness for any speed telescope, high contrast and transmission for natural color rendition, low scatter, and comfortable eye-relief. Being a zoom, we also concerned ourselves with making sure it was parfocal through the zoom range as well maintaining a constant apparent field of view. The one aspect we were not too concerned with was giving the eyepiece a wide AFOV. Limiting the AFOV to 50° and the eye-relief to 10mm, we were able to create a compact physical design employing only five elements to reach the optical goals. Like other "Naglers," it utilized a negative lens group ahead of the focal plane. This permitted relatively long eye-relief for very short focal lengths. By independently moving the upper and lower lens groups, we achieved constant focus (parfocality), constant apparent field of view, and essentially constant eye-relief. Just by rotating the upper barrel, you can zoom through the power range. Click stops offer known power points for reference without needing to look at the barrel and instantaneously choose the optimum magnification for the given observing conditions.